Which Is The Best Wheelbarrow For Horse Manure? Ah, the poo picking – everyone’s favourite job! Although it is less than fun, picking up your horse’s manure is essential for maintaining your field, especially if you have a smaller than average grazing area. Horses won’t eat the grass on which their manure sits (let’s face it, would you?) and leaving it laying about can affect the grazing for the future. The right equipment can make this less than appealing job much quicker and easier, so you will need to find the best wheelbarrow for horse manure. Different wheelbarrows are designed for different purposes, so it really will make the job much easier if you have the right one that is made for the purpose. This is a fantastic, sturdy, weight bearing wheelbarrow that will help you out no end in your quest for a clean field! It is easy to use and should make a difficult job easier and less back breaking. It has a steel tub not a plastic one – This not only makes the wheelbarrow stronger and more long lasting, but it means there is less likelihood of accidentally damaging it with a stray fork. Plus the contents should slide out more easily! Large wheels for ease of use – When you consider your horse field, I imagine that it is fairly lumpy, at least in places. This wheelbarrow’s off terrain suitability makes it perfect for any field, no matter how hilly. Easy to use – A decent wheelbarrow should be easy and simple to manoeuvre, but sadly they aren’t always, are they? This one requires very little help to make it stay steady and upright, which is a massive bonus. A wide, deep tray – This is essential when searching for the best wheelbarrow for horse manure. You want a barrow that can carry the maximum amount possible, to save you many trips back and forth to the muck heap. It doesn’t come assembled – For ease of delivery, this bulky item will arrive in parts. It’s slightly inconvenient, but not the end of the world! This is a great all round wheelbarrow for using to collect horse manure. The deep tray will take a lot before it needs emptying, and the metal construction will allow it to simply slide out. This is a beast of a wheelbarrow, with a huge capacity and a rugged construction, making it perfect for large fields or large herds. 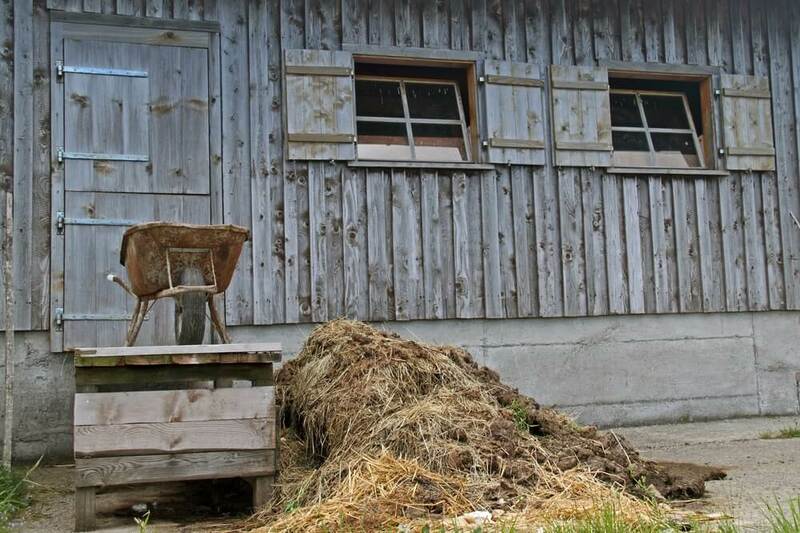 400lb load capacity – You can collect a lot of manure in this wheelbarrow. I mean, a lot! 400lb is a pretty heavy weight in anyone’s terms, and it means you can fill it with a lot of horse manure before you have to visit the muck heap. Wide track rubber tyres – Wider tyres mean a smoother ride, so you can be sure that this wheelbarrow will take much of the strain out of an already difficult job. Wider wheels mean a smother journey too. Polyurethane tub for longevity – This hard wearing plastic tub won’t rust or crack, meaning that you can use it for years to come. Shielded ball bearing inside the tyres – The fact that the bearings are kept safe from any floating debris or particulate means that they will not only give you a smoother trip, but they will last longer too. Assembly instructions can be confusing – If this is your first time putting together a wheelbarrow you may be advised to get a friend to help as they can be a little misleading! This is a good, sturdy, hardwearing wheelbarrow for collecting horse manure. It should last you through the seasons and put up with any amount of abuse and bad weather. This is a lightweight wheelbarrow, specially designed so that you don’t have to work with a heavy barrow as well as the heavy contents. It also comes in a jazzy colour – not that that should be a huge consideration for something that will soon be stained with less than pleasant colours! Air filled wheels – This makes the whole barrow easier to manoeuvre over rough terrain, as well as making it easier on the arms and the back. 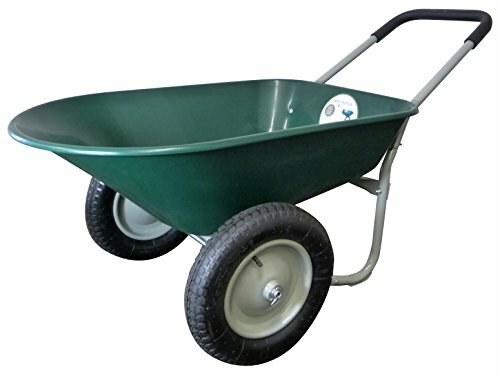 Rust proof polyurethane tray – There is nothing more frustrating when your best wheelbarrow starts to rust, and you know it will eventually fall apart. The strong plastic construction of this one means that is no longer as issue. Only 29lb in weight – This makes it, on average, about 25% lighter than a standard wheelbarrow. Features a loop handle instead of two arms – This unique attribute allows you to push, pull, or dump this wheelbarrow extra easily. May be too low to the ground for some individuals – The taller poo pickers among us may be better off searching for a wheelbarrow which is more suited to taller people, as you may have to stoop to catch hold of the bar. A great wheelbarrow with an innovative pushing arm, this one will be a valuable asset to any stable due to its hardwearing nature and the ease of emptying. A good wheelbarrow is an essential tool in any horse owner’s kit. It can save you hours of back breaking work if you have a good one, and can also save hours’ worth of trekking back and forth to the muck heap if you have one with a good capacity – those extra journeys can really put miles on your job, so finding one with a good tub capacity is a must. If you have been searching for the best wheelbarrow for horse manure then look no further; just have a look through the products about and you’ll be sure to find one that you love.